Auckland, based around two large harbours, is a major city in the north of New Zealand’s North Island. This unique and lively multicultural city, rated as the third most livable city in the world, is an exhilarating mix of natural wonders and urban adventures. EC Auckland is conveniently located in central Auckland, close to all the incredible sights and attractions this waterfront city has to offer. Auckland has a subtropical climate with warm humid summers and mild damp winters. The average daily temperature in Auckland during the summer is 23°C (74°F), while winter temperatures are on average 14°C (57°F). Auckland is one of New Zealand's sunniest regions with 2,060 annual sunshine hours, which make it quite comfortable all year round. Tap water in NZ is universally safe to drink. Auckland’s public transport is a great way to get around. It’s easy to travel by train, bus or ferry throughout the inner city and the wider region. Britomart in downtown Auckland is the main transport hub and is where many bus and train journeys start and finish. 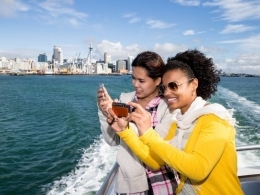 Ferries also arrive and depart from downtown Auckland, just two minutes’ walk from Britomart. A number of bus and train stations and some ferry departure points also have park and ride facilities – ideal if you’ve got a hire car or if you’re staying longer. It’s easier than ever to get around Auckland by bike, with a number of new cycle paths popping up in the last few years (and more new ones on the way). Flat, easy cycleways along the waterfront or through parks are great for families or the casual explorer, or you can tackle a more challenging trail through bush or farmland. Recommended budget in NZ$ to cover basic costs for transport, food and entertainment while attending EC Auckland: approximately NZ $150 per week. The driving age in New Zealand is 16 years. However, generally speaking, in order to drive basic model hire cars in New Zealand, you must be over 21 years old. This may vary depending on the category of car you decide to hire. Drivers under the ages of 25 may incur a young drivers' surcharge. The age for purchasing alcohol in New Zealand is 18. This means anyone who is aged 18 years or over and shows approved ID can enter licensed premises and buy alcohol. Smoking is permitted in outdoor areas associated with pubs, etc. Smoking in most public areas, including shopping malls, public transport, pubs, bars and restaurants is prohibited in New Zealand. All workplaces are smoke free. All international students need to have appropriate insurance cover regardless of visa type.